The Wildlife Conservation Society applauds the Government of Argentina for creating two enormous marine protected areas in Patagonia, a region filled with majestic shorelines and abundant wildlife. The new marine parks—Isla Pingüino Coastal Marine Park and Makenke Coastal Marine Park—were recently established by the National Congress in Argentina and will safeguard sea lions, penguins, dolphins, and other marine and coastal species. "We commend the Government of Argentina for their conservation stewardship in creating this new network of marine protected areas," said Dr. Cristián Samper, President and CEO of the Wildlife Conservation Society. "Isla Pingüino and Makenke Coastal Marine Parks now protect vital wildlife populations for posterity and create new opportunities for Argentina's ecotourism industry." Stretching some 80 miles south of Puerto Deseado and extending 12 miles out to sea, Isla Pingüino covers nearly 1,800 square kilometers (720 square miles) of ocean and cliff-bordered coastline. The new protected area contains large populations of South American sea lions, red-legged cormorants, and one of the largest colonies of imperial cormorants found anywhere (with more than 8,000 breeding pairs). Isla Pingüino also boasts one of the only colonies of rockhopper penguins on the coast of Patagonia. Both marine protected areas are steeped in history as well as natural wonders. Charles Darwin traveled to the region now contained in Isla Pingüino in 1833, describing the wildlife he observed there during his seminal voyage aboard the HMS Beagle. Makenke Coastal Marine Park now borders the inlet of San Julian, where in 1520 Ferdinand Magellan executed and marooned a group of mutineers intent on aborting what would become the world's first circumnavigation of the globe. "We commend the National Congress in Argentina for passing laws to create these new marine parks, which will protect the country's natural heritage given what will likely be an increase in development along the coast in years to come," said Dr. Julie Kunen, Director for WCS's Latin America and Caribbean Program. Dr. Caleb McClennen, Director of WCS's Marine Program, said: "Isla Pingüino and Makenke Coastal Marine Parks continue a tradition of conservation teamwork, with organizations such as WCS providing support to the government in protecting both coastal breeding areas for mammals and birds and the marine habitats they rely upon." Isla Pingüino and Makenke Coastal Marine Parks were made possible as a result of work conducted by Dr. Patricia Gandini, President of the National Parks Service, and Dr. Esteban Frere of the Universidad Nacional de la Patagonia Austral. Both biologists began studying the wildlife of the coast of Santa Cruz with support of WCS in 1985. Both areas were identified as priority conservation sites by the Patagonia Coastal Zone Management Plan project, carried out by both the Wildlife Conservation Society and the Fundación Patagonia Natural with support from the Global Environmental Facility and the UNDP (United Nations Development Program). Support for the research was also provided by the Consejo Nacional de Investigaciones Científicas y Técnicas (Conicet). WCS has been involved in the conservation of coastal Patagonia since the 1970s, beginning with Dr. Roger Payne's behavioral work on southern right whales, and continues to this day with research by WCS's Global Health Program on new threats to their survival. WCS began a long-running study on Magellanic penguins in the 1980s. That work led to conservation efforts that helped reduce the number of penguin deaths due to oil spills at sea from more than 40,000 a year to fewer than 1,000 annually, and helped move shipping lanes 30 miles offshore to avoid spills affecting seabird colonies. WCS has also been conducting research on southern elephant seals, South American sea lions, rockhopper penguins, cormorants, gulls, terns, and other species that breed along the shores of Patagonia. 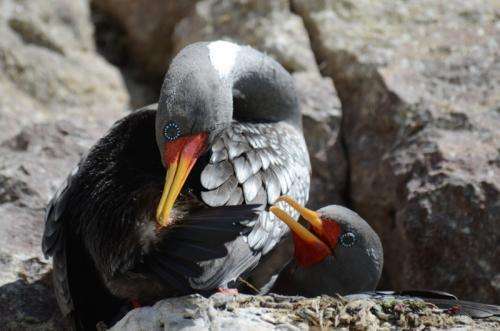 These studies informed the region's first atlas of breeding seabirds, a work designed to guide management decisions on fisheries and other natural resource usage. Over the past 40 years WCS has helped Argentina transition from harvesting of coastal wildlife to a burgeoning tourism industry based on its spectacular coastal species. These two new parks are the latest addition to the country's extraordinary marine conservation effort. WCS's efforts to help protect wildlife on the Argentine coast and sea are generously supported by the Liz Claiborne and Art Ortenberg Foundation, the Mitsubishi Corporation Foundation for the Americas, the Waitt Foundation, and others.